Chennai, the first city of the south, and capital of Tamil Nadu, though comparatively young, has a chequered history dating back to 1639 when Francis Day and Andrew Cogan, agenst of the East India Company acquired a strip of land granted on lease by the Vijayanagar Emperor. Here was built the Fort St. George for setting up a factory as a nucleus around which arose the British settlements. Gradually but steadily the old, tiny villages like Triplicane, Egmore, Purasawalkam and Chetput were clubbed with the new agglomeration of the fast growing Chennapatnam, as it was known then. Chennai, widely known as Madras till 1996 has a rich tradition and civilisation with a blend of the old, and the new, vibrating ceaselessly to keep pace with the rest of India, as the buoyant metropolis of the third most industrialised State. People in Chennai are deep rooted in their cultural moorings and traditions, even though modernity has its own impact. Chennai is airy, spacious with verdant green patches and beaches. With a population of about six million, Chennai is the fourth largest city in India. It has played a notable role in deciding the political destiny of India on many an occasion Chennai has regained its pride of place in the automobile industry as the 'Detroit of the South'. Days are not far away when Chennai may be a 'Silicon City' with high-technological knowledge in history, still lives in Chennai. A visit to Chennai to see the graceful people of glorious land will surely help the visitor to carry home this imprint of Indian heritage. Chennai. the capital seat of Tamilnadu and a metropolitan is a major gateway to the South. A long sea coast on its Eastern horizon by the Bay of Bengal claims to be the second largest sea shore - the Marina Beach. The City's territorial and geographical development has been an ongoing process right from the Britishers acquisition of the land . The Britishers took the city off to settlement & habitat with the fortification of St. George Fort for administrative and military power. Presently functions as Tamilnadu Legislative Assembly. Birla Planetarium built in the memory of B.M. Birla, the well-known industrialist and visionary. It forms a part of Periyar Science and Technology Centre at Kotturpuram. This planetarium brings to life celestial phenomena complete with special effects. Courses on astronomy and night-sky observation are conducted on every second Saturdays. 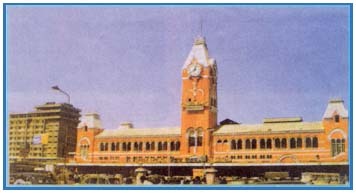 Chennai Central Railway Station : Chennai's prestigious central railway station is undergoing a cosmetic change with services and facilities offered to match with international standards. You could now receive your guests at central station with a bouquet, thanks to the newly opened florist shop inside the station, which offers bouquets ranging form Rs. 5/- to Rs.350/- . The other visible change is the newly opened book shop at the new waiting hall. This Higginbotham's Book shop has an area of 850 Sq.ft. including a mezanine floor. The ground floor has newspapers, magazines and fiction books of all languages. The mezanine floor is filled with books on medicine, management, computer, greeting cards, stationery and audio cassettes and C.D's. Very shortly you will be able to hire cell phones at Central Station. Indian Bank is planning to install an A.T.M. inside the statiion, with additional facility of offering loose change and also exchange of foreign currency. A new air-conditioned waiting hall with the like of a star hotel's lounge is to be opened shortly. Here passengers could stay upto 4 hours by paying a nominal charge and avail additional facility of free coffee/tea and newspapers. Also on the railways plan is a scheme to offer two wheelers and cars on hire. Chennai corporation has sought permission from the railways to put up a 'chennai information booth' inside the station for the facility of tourists. Passanger traffic at Chennai Central is 1.25 Lakhs per day. St. Thomas Mount : This 300 feet hgih mount is situated near Meenambakkam. Legend has it that St.Thomas, an apostle of Christ preached atop this hill. The paintings, 'The Holy Lady and The Child' and 'Our Lady of Expectations' which are believed to have been done by St.Thomas are exhibited in this Church. Government Museum : This is the repository of rare exhibits of weapons, Uniforms, Coins, Costumes, Medals and other artifacts dating to the British period. The museum's possessions are the relics from the 2nd Century A.D. Buddhist Site at Amaravathi & Pre historic exhibits from the stone & Iron ages. The bronze gallery with its ancient icons and modern bronze is perhaps the best in the world. 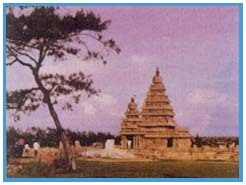 Mamallapuram : It is also known as Mahabalipuram. This ancient seaport was built in the 7th Century by Emperor Mahendravarman Pallava. The places of interest here includes Arjuna's Penance, Krishna Mandapa, Mahishasura-Mardhini cave, Pancha Rathas, Shore Temple and Varsha Mandapa. Sri Kapaleeswarar Temple : The residing deity is Lord Kapaleeswaran. It was built by the Pallavas in the 8th Century in ancient Mylapore. Later, additions were made by the Cholas, Pandyas and the Vijayanagara Kings. The highlight of the temple is the 120 ft. gopuram. The bronze statues of 63 Saivaite saints are also worth seeing. The annual festival of the temple is held in March. High Court : This grandiose Indo Sarcenic structure is the centre of judicial activity of Tamilnadu. Situated near Parry's Corner, this granite Doric Column was originally constructed to function as a lighthouse in 1841. The Assistant and Additional City Civil Courts, Small Causes Courts and a number of Tribunals also function here. With the decorative domes and corridors reminiscient of Indo - Sarcenic architecture together with the adjacent Parrys Corner are the important landmarks of Chennai. This area is always crowded and active. 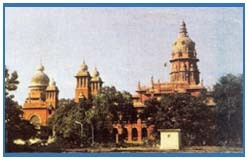 Built in 1892, the High Court of Chennai is believed to be the second largest judicial complex in the world. Marina Beach : World's second longest beach and pride of Chennai city. The beach drive runs between stately buildings on one side and vast stretches of the sandy shore on the other side. Particularly noteworthy among the buildings are the University of Madras, Chepauk Palace, Ice House, and DGP Headquarters. Anna Square and MGR Memorial situated alongside the beach road are flocked by people paying their respects at the samadhi of Late Chief Ministers of Tamilnadu Dr.C.N.Annadurai and Dr.M.G.Ramachandran. Valluvar Kottam : On the junction of Kodambakkam High Road and Nungambakkam lies Valluvar Kottam, the memorial built in 1976 in honour of the Poet-Saint Thiruvalluvar by the Present Chief Minister of Tamil Nadu, Dr.Kalaignar Karunanidhi. Shaped like a temple chariot or ratha, it is one of the most distinctive structures in the City and is shaped like a temple chariot and is, in fact the replica of the temple chariot in Thiruvarur. A life-size statue of the saint has been installed in the 39 metre tall chariot. The 133 chapters of his famous work "Thirukkuaral" have been depicted in bas-relief in the front hall corridors of the Chariot. The auditorium at Valluvarkottam is said to be the largest in Asia and can accommodate about 4000 people. National Art Gallery : The Pantheon Complex was built before 1789 and was a place of assemblage for the British till it was bought by the Government in 1830. Later, several new buildings were added to it. Today, this complex houses the Government Museum, the National Art Gallery and the Connemara Public Library.The National Art Gallery exhibits serveral beautiful paintings, which include 16th and 18th century ones from Rajasthan, the Mughal period and 17th Century Deccan Art. There are display of bronzes from the 10th and 13th centuries and Indian handicrafts from the 11th and 12th centuries. 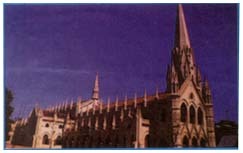 Santhome Cathedral : Santhome, at the southern end of Marina derives its name from St. Thomas, an apostle of Christ who is believed to have come to Chennai sometime during 52 AD. He was believed to have been killed on St. Thomas Mount just outside the city in 78 AD and was interned in Santhome beach where a church was later built. Serveral years after, another church was built further inland and his mortal remains were transferred from the former to the latter. In 1606 the Church was re-built as Cathedral and in 1896 it was made a Basilica. The beautiful tainted glass windows at the basillica portray the story of St. Thomas and the Central Hall has 14 wooden plaques depicting scenes of the last days of Christ. In the Cathedral is a 3 feet high statue of the Virgin Mary which is believed to have been brought from Portugal in 1543. Fort St. George : Built in 1640 by the British East India Company, today it houses the Legislature, the Secretariat and Ministries of Tamilnadu Government. St.Mary's Church the first Anglican Church in India is also situated here. In the Courtyard of the church are the oldest British tombstones in India. The Fort Museum has a collection of arms, rare coins. paintings and artifacts. The Fort has the tallest flagpole in India. It is situated on Beach Road. Vedanthangal Bird Sanctuary : The silvan woods attract over four lakh feathered species annually especialy during the Monsoon period. There is also a watchtower for the ardent bird watchers. Kovalam : Mainly popular as a luxury beach resort, this beach has a fort built by the Nawab of Carnatic. There is a Dargha and an ancient Church here. Sriperumbudur : This is the birth place of Vaishnavite Saint Ramanujar. Ancient temples of Lord Siva and Lord Perumal are situated here. Rajiv Gandhi Memorial raised in honour of Rajiv Gandhi, late Prime Minister, who was assassinated by human bomb in 1991, is also located here. 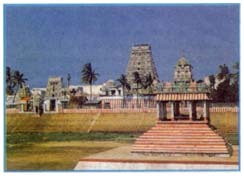 Mangadu Temple : Between Poonamallee and Iyyappanthangal is the temple dedicated to Kamatchi Amman. Legend has it that Paravathi as Kamatchi did penance standing on a needle-point for Lord Siva. Cholamandalam: Founded in 1966 by Dr.K.C.S Panicker, the former principal of Government College of the Arts and Crafts, this place is also popularly known as the artists' village. Muttukadu : The backwaters of Muttukadu has been developed by TTDC as a centre for water sport. Windsurfing regatta is organised annually during the month of February. Crocodile Bank : This Crocodile Breeding and Research Centre has many species of Indian and African crocodiles and alligators. The various sizes of crocodiles from the newly hatched ones to fully matured crocodiles can be observed here. St. George's Cathedral : On Cathedral Road, is this imposing structure built in 1815. Its striking spire and lonic columns are worth seeing. Adjacent to the Cathedral is the graveyard with its guardrail made up of muskets, bayonets and other war emblems - all from the capture at Srirangapattnam in 1799. Theosophical Society : The world headquarters of Theosophical Society, founded by Madame H.P.Blavatsky and Col.H.S. Olcott in 1875 is situated on the silvan banks of Adyar estuary. It includes a Library, a research centre on oriental culture, shrines to all faiths and the Garden of Remembrance. Also worth seeing is the world famous Banyan Tree, the roots of which spreads over an expanse of 40,000 sq.ft. Vandalur Zoo : Spread over an area of 1,265 acres, the Anna Zoological Part at Vandalur is the largest in South Asia and has a rich variety of different species of mammals, reptiles and birds. Mini safaris are organised here. Elliot's Beach : A favourite 'night-beach' of Chennaite youth, this beach at Besant Nagar is relatively cleaner than other beaches. Ashtalakshmi Temple, one of the three shore temples in the East was built on this shores. Film City : This sprawling campus at Taramani has facilities ideal for film production. Run by the Governmnet of Tamilnadu, it is also a popular tourist centre. Guindy National Park : A large number of jackal, civet cats, black buck, mongoose, monkeys and spotted deer can be seen in this small National Park which is located on Sardar Patel Road in Guindy. This is the only National Park in India. which is located in the city itself. Nearby is the Snake Park founded by Romulus Whitaker. Kalakshetra : Located at Thiruvanmiyur, this famous school dedicated to traditional South Indian dance forms, crafts and carnatic music was founded in 1936 by Rukmini Arundale, the renowned exponent of Bharatanatyam. The institution follows the ancient Gurukula system of education and forms a part of the Annie Besant Cultural Centre. Pantheon Complex: This stately complex at Egmore encompasses the Government Museum, the National Art Gallery and the Connemara Public Library. The Museum has a collection of rare coins, vintage stamps, antiques and musical instruments. It also has one of the finest bronze collections. The National Art Gallery has among its exhibits paintings and handicrafts which are dated as old as 7th century. Big Mosque : This renowned place of worship for Muslims was built in 1795. It is situated among modern buildings on Triplicane High Road. This granite structure is a place of solemnity and peace. Gurudwara and Jain Temple : Both the places of worship are located on G.N.Chetty Road. The two-tier 70' high Jain Temple is built of lime, soapstone and marble. Nearby is the holy place for Sikhs, Sri Gurunanak Sath Sang Sabha. Sri Parthasarathy Temple : Also built by Pallavas during the 8th Century, this temple at Triplicane is dedicated to Lord Krishna. An unique feature at the temple is the five avatharas of Lord Vishnu. The annual festival of the temple is held in December. Arignar Anna Zoological Park : Animals are exhibited in a large open island type enclosure with simulated natural environment. Other attractions are Nocturnal Animal House, Safari Parks, walk through Aviary, Pre-historic animal park, Zoo education and interpretation, Prey-Predator enclosures and an Aquarium. Battery operated vehicles are available for taking visitors around the zoo, besides elephant rides and Lion Safari vehicles. Light House : The lighthouse now stands 48m above sea level at the southern end of the Marina commanding a panoramic view of the city. 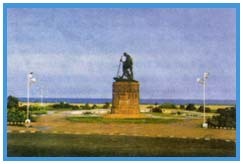 Victory War Memorial : The Victory War Memorial situated on the Marina beach road in the area which housed the coastal belfry, honours those who have laid down their lives for their country in the World Wars. It is to commemorate the victory of the allied armies during World War I and later became the victory war memorial for the World War II in memory of those from Chennai Presidency who lost their lives for the nation. Thousand Lights Mosque: This is a centuries' old shrine that has been redesigned as a mosque with walls bearing recently painted saying from the Holy koran. The original mosque was constructed by Nawab Umdat-ul-umrah in 1800. Birla Planetarium : This Birla planetarium at kotturpuram situated between Adyar and Guindy, is the most modern planetarium in the country. 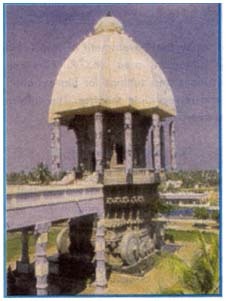 It houses a modern fully computerised projector which depicts the heavens on a hemispherical dome. The planetarium presents to the visiting public and students, audio-visual programmes on various themes in astromony. Adjoining the planetarium is the periyar Science and Technology Museum which is of interest to students and other science enthusiasts.